I’ve wanted to learn how to bake sourdough bread for years, the only problem is that I bake and love so many of my yeast bread recipes that, so far I’ve never approached this adventure. Dry or fresh yeast allows me to make a fresh and warm bread within a couple hours where as sourdough demands days of preparation. Most of the time, my baking isn’t really planned far ahead, my mood decides what I will put in the oven. With the right ingredients a yeast bread is wonderfully juicy and spongy but I have to admit that it never creates a crust comparable to the more time-consuming alternative which also has the advantage that you can keep it for days. This is impossible with yeast bread, but to be honest that has never been an issue as all the fresh bread coming out of my kitchen doesn’t survive for more than a day or two! I know that one day sooner or later I will give the sourdough a try, but till then there is still a lot of bread to bake. 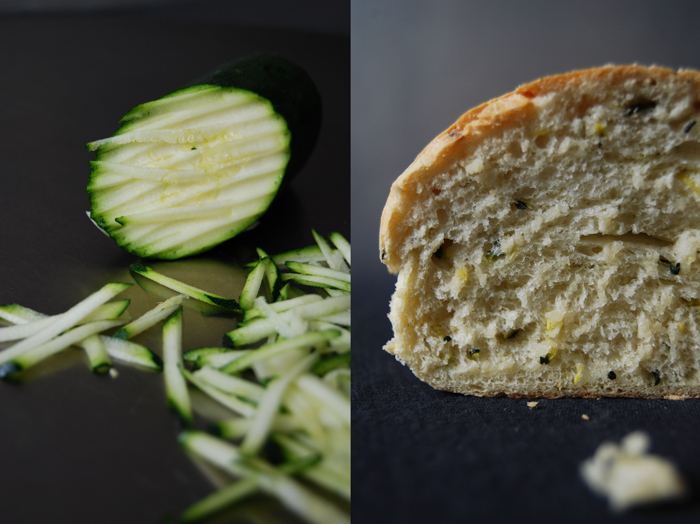 One option, which is as juicy as my olive bread, is a loaf made with grated zucchini (courgette) which makes the texture so soft and spongy that it doesn’t need more than some olive oil or butter spread on top. I served it with ramp (yes, again) butter when we had some friends over and I liked that a lot as well, it made it a bit garlicky. It’s really quick to bake, it only needs 20 minutes in the oven! Put the grated zucchini in a sieve over a bowl, add 1/2 teaspoon of salt and mix with your fingers. Set aside for 15 minutes, rinse under cold water for a few seconds and squeeze the water out with your hands. Spread the zucchini on a tea towel and push another towel on top to dry. Scrape off the towel and set aside. 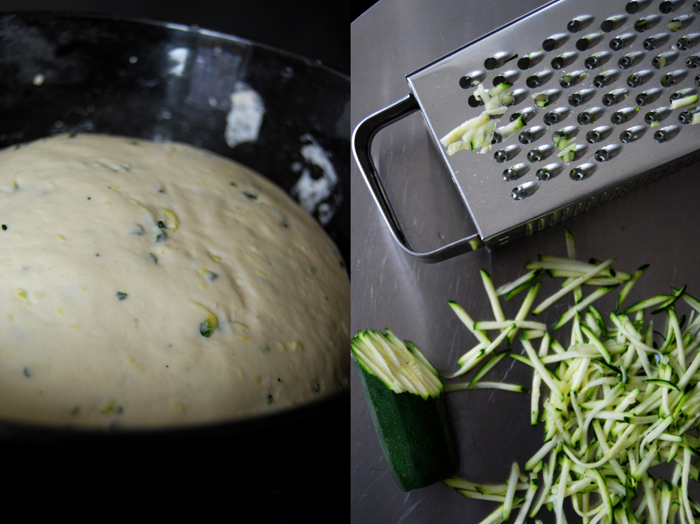 Combine the dry ingredients, add the zucchini and water and mix with your dough hooks for 5 minutes until well combined. Continue kneading with your hands for a few minutes until you have an elastic dough ball. Put the dough back into the bowl and cover with a tea towel. Let the dough rise in a 35°C / 95°F warm oven for 45 minutes. This works really well but make sure that your oven is set to top/ bottom heat and not to fan. Take the dough out, punch it down and knead for 1 minute. Form 2 long loaves and put on a baking sheet lined with parchment paper. Cover with a tea towel and let them rise for 30 minutes in the warm oven. Set your oven to 220°C / 430°F. Brush the loaves with a thin layer of olive oil and bake for 18 minutes or until cooked through. If you’re not sure if it’s done turn the bread around and knock on its underside, it should sound hollow. 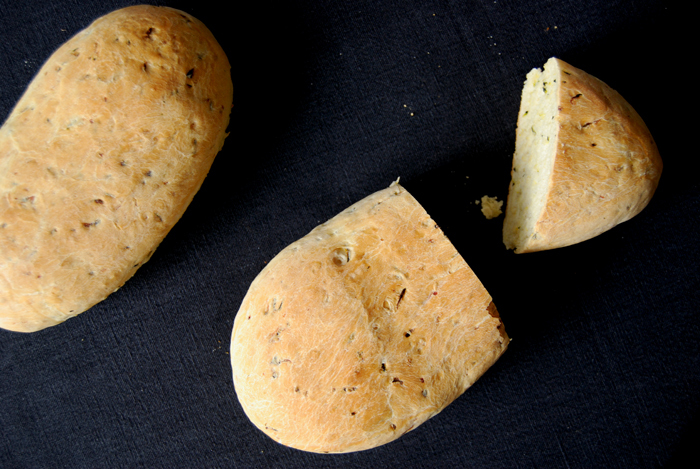 Let it cool for a couple minutes before you enjoy the first slice of your freshly baked bread. 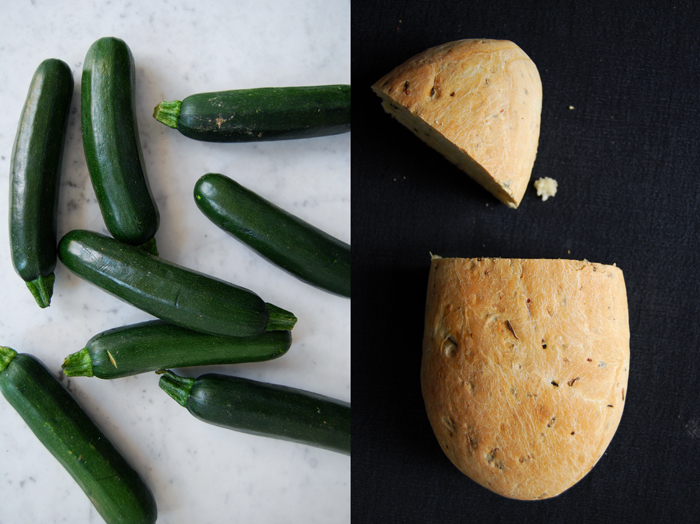 One question… If I want to freeze one loaf of bread, when shall I do it, after the first rise or after baking?